In classical art, on the one hand, and what I would call the 'rhythmic' insular art on the other, we have two extremes, each of which invites us to take the art seriously as a religious act. Centuries of classical culture enabled St John of Damascus and, in a more extreme form, St Theodore to argue for an ontological connection between the 'prototype' (the saint, Christ, the Virgin) and the painted or sculpted likeness, an argument which, I have suggested, would have made no sense to the insular artists for whom the sacredness of the art lies more in the act, in time, by which it is made and the analogous act, in time, of looking at it. The one, we might say, is an art of veneration, the other an art of contemplation. Where does that leave the non-insular art of Carolingian Europe? 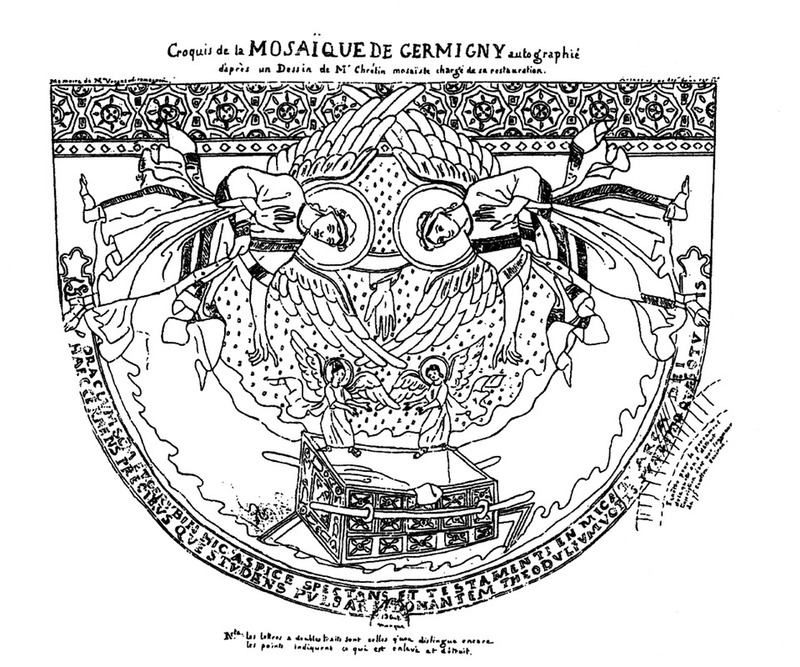 When I first proposed to talk on this subject I had hoped to be able to demonstrate the existence of a distinctive Carolingian art which tried, more or less successfully, to fuse the two, preparing the way for what I would regard as the successful fusion two centuries or so later in what is called 'Romanesque' art. I also hoped that the Opus Caroli, written in reaction to the classical art of Nicaea II, would indicate awareness of the alternative values embodied in the insular work, even that it might have been the treatise on insular art we need so badly. The Opus Caroli has not yet been translated into English but on the basis of Noble's account it seems unlikely that such a case can be made. We might regret that it was not written by Alcuin, a product of insular culture, but by Theodulf, a refugee from Visigothic Spain. To judge by the detailed account given by Noble it is largely an argument against taking the visual arts too seriously. The approach resembles in some ways a Protestant attitude to illustrations of Bible stories. Religious imagery can be helpful but it is not necessary and certainly should not be regarded as an object of veneration nor is there any indication that the organisation of shapes and colours can be seen as a useful focus for religious contemplation. Theodulf insists that the Christian mysteries must be contemplated in the heart not through the eyes. But Theodulf, one of the finest poets of his age, cannot be accused of lacking an aesthetic sense and it happens that we do have an important work of art associated with him - the mosaic in his private chapel in Saint-Germigny-des-Pres. [Fig 11a]. Germigny-des-Prés, apse mosaic, 9th century (photo: R.and M-J.Friedlander). 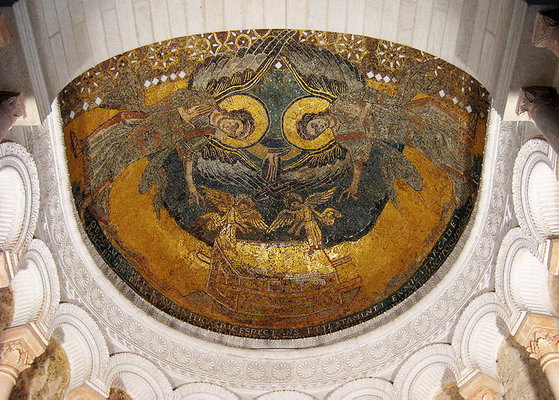 Ann Freeman and Paul Meyvaert: 'The Meaning of Theodulf's apse mosaic at Germigny-des-Prés' in Gesta, Vol 40, no. 2 (2001), pp. 125-139. See e.g. Jenifer Ní Ghrádaigh: ‘Audience, visuality and naturalism: depicting the Crucifixion in tenth-century Irish art’ in J.Rutherford and D.Woods (eds): Mystery of Christ in the Fathers of the Church, Dublin 2012. [Fig 11b] Germigny-des-Prés, apse mosaic, 9th century, after a drawing by Théodore Chrétin, after Vergnaud-Romagnesi: Addition à la notice sur la découverte en janvier 1847 de deux inscriptions dans l'église de Germigny-des-Prés, Orléans, 1847 [copied with the caption - hence the 'after's - from Ann Freeman and Paul Meyvaert: 'The Meaning of Theodulf's apse mosaic at Germigny-des-Prés', Gesta, Vol 40, No 2 (2001), p.130. It is not possible here to discuss the larger question: was there (as is sometimes suggested) a Carolingian fusion between the two extremes of insular and classical art; and if so, was it based on a theological understanding either of the contemplative insular art or of the theory of prototype and image which was evolving in the eastern classical tradition to support the veneration of religious imagery? My own feeling is that the Opus Caroli’s somewhat dismissive attitude to the religious image – the refusal to see it as a means of entering into communion with the divine – was typical of the wider society. It is an essentially illustrative art (the outstanding example being the almost comic book illustrations to the Utrecht Psalter). The classical influence is strong but does not undergo the changes that occurred in the East to make of it an art of veneration (thereby becoming what we like to call ‘Byzantine’ art). The decorative side uses elements that are familiar from insular art but they have now become indeed ‘merely’ decorative, lacking the rigour and seriousness of a truly contemplative art. Nonetheless, elements of a different approach to the sacred in art – both illustrative/figurative and decorative/contemplative – were emerging, notably in Visigothic Spain. 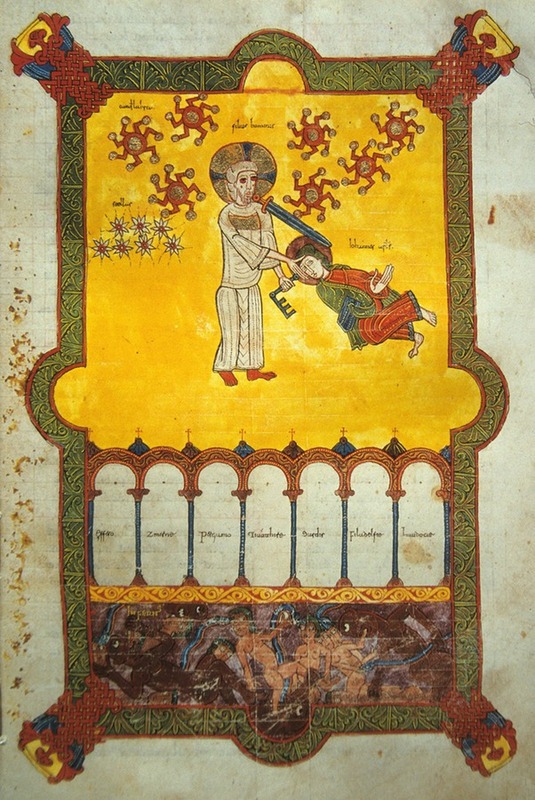 [Fig 12a] Illustration to the commentary on the Apocalypse by Beatus (the commission to write to the seven churches), 1086, cathedral of Burgo de Osma, folio 23 (photo R. and M-J.Friedlander). The Visigothic culture of Theodulf's origins had, much more than the Franks, aspired to assume the classical heritage, to become Roman. It knew classicism intimately. It is perhaps worth mentioning in the present context that Visigothic Spain in the tenth century produced the most defiantly unclassical art of the Beatus manuscripts. Rather than seeing this as a 'primitive' art of a people who did not know classical art it would be better to see it as a quite conscious rejection of classical art by a people who knew it very well. It is the marrying of a non-classical figuration with an overall decorative/contemplative rhythm that will characterise the distinctive genius of Romanesque art. 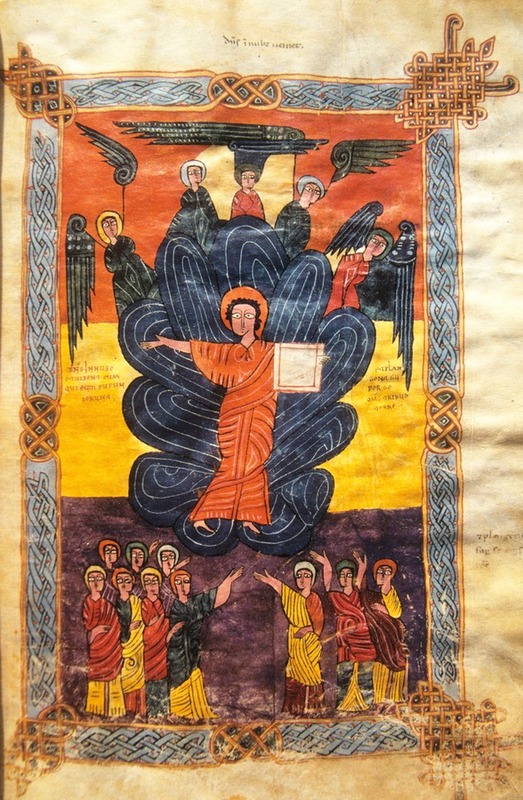 [Fig 12b] Illustration to the commentary on the Apocalypse by Beatus (Christ's appearance in the clouds), 10th century, Musei Diocesá de La Seu d'Urgell, folio 19r (photo R. and M-J.Friedlander).